Great Neck, NY (August 16, 2018) – When Sherry Ackerman opened up her son Ayden’s camp trunk and saw a shirt that did not belong to him, her confusion quickly turned to angst as she fretted over what to do with the garment she did not anticipate receiving. 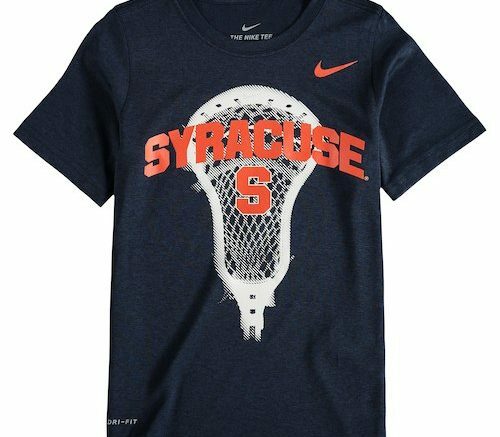 The navy blue Syracuse Lacrosse shirt with J. Nussbaum stitched into the inside collar completely threw the mother of two for a loop and set off a frenzied dilemma as to how she should handle the garment. Getting campers’ clothing returned to the wrong person has been an occurrence for as long as anyone can remember. Typically, a t-shirt or pair of shorts makes its way into the wrong duffel bag on the last night of the summer sometimes on purpose but, more likely, by accident. In the mid to late 1980’s there was a rash of Champion sweatshirts that were reported missing each summer by concerned parents who shelled out between $30 and $35 for the ultra-popular fashion statements. A million thoughts raced through Ackerman’s mind while she held the shirt in her hands. She mentioned that she should probably wash the shirt even though it was probably washed by the camp before it got packed but the camp washing machines are not the greatest plus if she returns it to Nussbaum, his mother will most likely wash it anyway. She then realized that sending the shirt would cost her at least six to seven dollars in shipping fees so it probably would only be worth returning the estimated five dollar shirt (due to wear and tear over seven weeks of camp) in person but her son, Jake, would not be seeing Nussbaum until the camp reunion in January and Nussbaum wouldn’t wear a short sleeve shirt during the cold Marlboro winter anyway. After consulting with Jake, Ackerman considered taking the label out of the shirt and giving it to her younger son since, based on the camp pictures she’d looked at all summer, Nussbaum looked a bit huskier than in the past and would only be able to wear the shirt one or two more times tops before it became way too tight. Much to her chagrin, her son decided he didn’t want anyone’s hand-me-downs and, worse than that, she realized he was a Jewish child who did not aspire to attend Syracuse University. While the situation is unlikely to resolve itself in the next several days, Ackerman will attempt to move on from this by occupying herself with thirty plus loads her children’s laundry and organizing their camp belongings for next summer. Unbeknownst to Ackerman, eight of Jake’s shirts were packed in other kids’ trunks and will never be seen again. Be the first to comment on "Mother Panicked Over What to Do with Random Shirt Returned in Son’s Camp Trunk"